Tag line: "A lot can happen in the middle of nowhere"
Put Police Chief Marge Gunderson (Frances McDormand), with her thick Minnesota accent and imposingly pregnant physique, in any other film, and she’s the comic relief. In Fargo, Joel and Ethan Coen’s 1996 award-winning tale of extortion and brutality, Marge is much more substantial; a professional who pieces together clues as meticulously as Sherlock Holmes, and a beacon of hope in what quickly becomes a hopeless situation. Car Salesman Jerry Lundegaard (William H. Macy) is bogged down by some hefty financial troubles. He would ask his wealthy father-in-law, Wade (Harve Presnell), for help, but Wade doesn’t think all that highly of Jerry as it is. So, he does what any sensible man in his position would do; hire two out-of-state goons to kidnap his wife (Kristin Rudrüd) and demand a ransom of $80,000 for her safe return, an amount Jerry is sure Wade will cough up to save his beloved daughter. Intent on splitting the $80k with his cohorts, Jerry is relieved when the abduction goes off without a hitch, but as the kidnappers, Carl (Steve Buscemi) and Gaear (Peter Stormare), are driving the panic-stricken Mrs. Lundegaard through Brainard, Minnesota, the unthinkable happens: people start dying. Enter Brainard’s Chief of Police, Marge Gunderson, a woman as incredibly sharp as she is incredibly pregnant. With Marge on the case, Jerry Lundegaard has little choice but to sit back and watch his entire plan unravel before his eyes. Whereas Marge Gunderson shows off her intelligence early on, piecing together exactly what transpired at the first murder scene right down to the last detail, the remaining characters in Fargo go to great lengths to display just how stupid they really are. First, there’s Jerry Lundegaard, who not only trusts two complete strangers to kidnap his wife, but also expects his abrasive father-in-law to hand over the ransom money with no questions asked. Obviously, thinking things through isn’t Jerry’s strong suit. Then there's Carl and Gaear, two guys who, in less than 24 hours, turn a pre-arranged kidnapping into a triple homicide. With all three failing to adequately cover their tracks, solving this particular case will be as close to child’s play as murder can get for Marge Gunderson. As the events of Fargo roll along, spiraling into a quagmire of confusion and violence, Marge Gunderson remains in perfect control, drifting in and out of the film like a morning breeze, and keeping her head about her while all around are losing theirs. 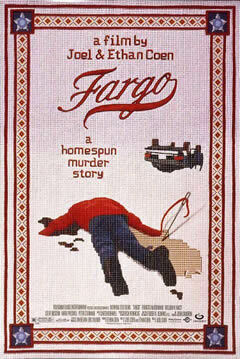 Humorous mannerisms aside, Marge Gunderson is the only character in Fargo that’s worth a damn.